A Reluctant Life, A Wife’s Journey Through Love and Loss” is a profoundly felt and beautifully written chronicle that is a quietly poetic brave accounting of the process and permutations of grief, after losing her husband, Dieter to a rare form of cancer in 2009. Yvette Nachmias-Baeu is particularly adept at making deeply personal moments — like sorting through Dieter’s shoes after his death, or rearranging the bedroom they shared in a burst of anxious energy — universally recognizable. It is easy to imagine oneself in her place, and there were times I had to stop reading to clear away the tears. This book is powerful and it is likely to prompt personal questions about the nature of love, the people we choose to travel with on life’s journey, and who we are and who we become in our relationships. It should be emphasized though, that where the book is difficult, it is not unrelenting. Like grief itself, the emotions expressed in her writing ebb and flow; profound despair is balanced by profound gratitude for the life, love and connection she found in marriage. “People who love deeply as she did must experience such depths of grief, but not many can put it into words that resonate so powerfully on the page. The love she shared with Dieter is palpable. “At this very moment, right now I read a book written by a lovely lady I recently met. Her name is Yvette Nachmias-Baeu. 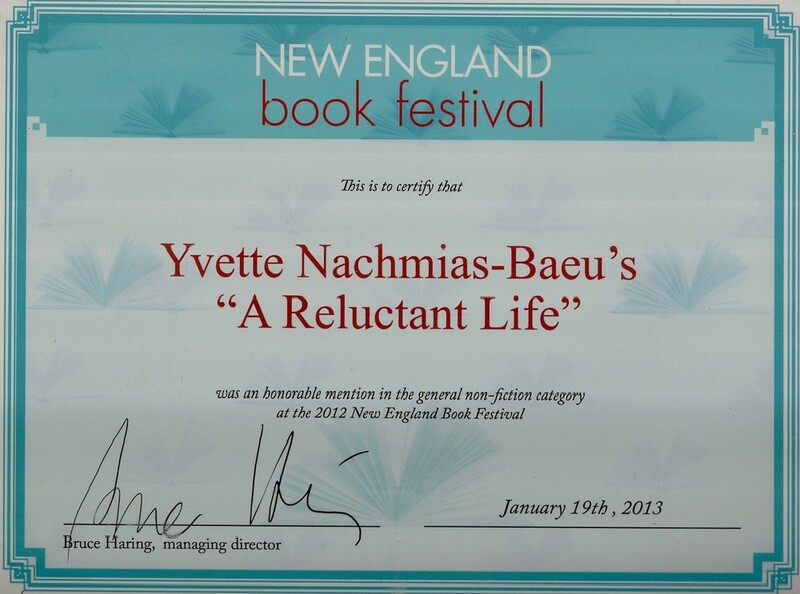 The book, A Reluctant Life, details the death of Yvette’s husband Dieter. The passion detailed here the emotion detailed here, the beautiful passion, as the mystery of death comes and then goes, the devotion of shared love, real love the kind of love so rarely seen, a love so many of us try to understand, a love we envy and look at with admiration. There is such sadness here and at the same time such beauty. And so, I say to you go and find this book, Amazon with all it’s problems certainly still works. Get the book. Put on a favorite piece of music, open the tissue box sit back and participate in the mystery of life, the mystery of death. Enjoy what you think cannot be enjoyed, but then find that you do. “The beauty of her writing is powerfully evident. I really noticed the quality of her writing when I read the excerpt in the back of the book. “The book is beautiful and befits celebration. A wonderful tribute to a life together. It is now, the book so spare and jewel- like. You have lost none of the spirit and love that you began with. “By the end of page 25, I felt a sadness, emotions swelling up and my eyes ready to moisten. It dawned on me that this chapter could use something preceding it, like written training wheels to get us (men) used to what was about to well up inside of us. I don’t know how I am going to proceed when such a small piece of text can have such an effect. I’m putting a box of tissues in my room, just in case. I absolutely love this book and feel gifted to have been in the right place at the right time to encounter your grace. “Thank you for penning the beautiful chronicling of and tribute to your life with Dieter before, during, and after his death. It’s magnificent, and while there are portions of the reflections in which you wonder “why” you’re writing what you are, or “what will come of it” – I think the answer is heralded in another heading: “Something Worth Knowing.” So being all dehydrated from the copious tears that streamed from empathy, the exquisite appreciation of your honesty, and knowing bits of it myself, there is a great deal to process after having read it essentially in one sitting. Will re-read over the years, I know, and treasure the brave and poignant manner in which you chose to share your journey. “Such a joy to receive your book, so strong and beautiful amidst the suffering and loss, teaching us that love and renewal are at the heart of everything. “I read the “Last Letter” a zillion times. If I still had a memory, I would know it by heart! Spending time in “A Reluctant Life” makes us wish it might have happened differently, but I thank you for sharing it in such an honest and heart stirring way. There is a great desire to give your book to everyone I know. “I finished reading your book last night. I know it wasn’t meant to make you look wonderful but that is inescapable because you are who you are. I was slightly resistant to the first chapters because of my quite unreasonable suspicion of poetry and your quoting of Wordsworth and Coleridge felt a bit like an announcement of the poetic worthiness of your feelings. (I said it was quite unreasonable). But as I got into it, all your openness and honesty shone through so clearly and was expressed so well, that I finished the book heartbroken at your loss and pain. I thought you spoke brilliantly of your anger at being left. It would be so easy to gloss over anger and you avoided nothing. You also left out everything that was not intimately connected to feeling and that was a triumph too. Writing about personal grief (what other kind is there?) is full of difficulties and pitfalls and you avoided the pitfalls completely. You have no choice but to keep writing.